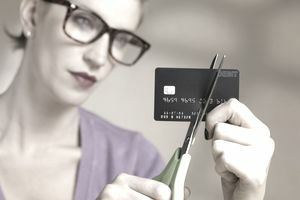 If you find yourself using the credit cards each month to cover the last week or two or to hold you over to payday, you may be wondering how you can break the cycle. It is important to stop relying on your credit cards because it adds to your debt each month and prevents you from building wealth. Credit cards have high interest rates, so it is important to act quickly and stop paying more for purchases than they are worth. An important step to getting control over your credit cards is setting up a budget. Start by looking at your income and analyzing your expenses. Track your spending habits so you can see where you are spending your money. This is important so you can change the habits that are leading you to use your credit cards each month. This will help you to really begin to make changes. Put it in writing. Start by writing down your most important, recurring expenses, such as rent, a car payment, utilities, insurance, etc. Whatever is left from what you earn is your discretionary spending. By writing it down, you are making it clear to yourself and reminding yourself just how much money you have to spend. Plan your monthly budget carefully and keep your priorities straight. Remember that food, shelter, and power come before your new shoes, iPhone, or game system. If you do not stick to your budget in all categories you may run out of money for the necessities. Planning can help you stop having small emergencies that throw you off. Of course, the difficult part is following the budget. At first, it's a good idea to track everything you spend so you can be sure you are not overspending. One of the most effective ways to stop using credit cards is to stop carrying them with you. Instead, carry cash. When writing your budget and determining how much money you have for discretionary spending, start carrying that amount of money in cash instead of carrying a credit card. For example, if the amount you determine you have to spend on discretionary expenses averages out to $100 per week, then pick a day of the week and withdraw $100 on that day every week. That's your allowance. When it's gone, you have no more money for discretionary expenses until the same day the following week. When writing your budget, one of the expenses that should be high on your list of priorities is paying yourself in the form of savings. This is good to give you the flexibility down the road to make a major purchase, such as buying a home, but it also helps you to build an emergency fund. If using your credit cards to pay for unexpected expenses is one of the things that got you into debt in the first place, it's important to build a reserve of cash you can use so you don't need to bury yourself in debt the next time an emergency arises. Until you are out of debt, an emergency fund of about $1,000 should cover most emergencies, and after you are out of debt, an emergency fund of three to six months of expenses should be enough. Another important part of your budget is the money you commit to paying down your debt. Ideally, you should sacrifice as much of your discretionary spending as you can tolerate in order to lower your debt as quickly as possible. Once you are out of debt, you will effectively increase your spending power without the cost of interest that comes with accruing debt on credit cards. To keep yourself from falling back into bad habits, freezing your credit cards in a big block of ice is really not that bad of an idea. You also should delete the numbers from your online stores' accounts which will make it harder to shop there as well. To speed up the process of paying down your debt, consider transferring your high-interest rate balances to a new credit card with a lower rate. However, only do this if you do not use the new cards for any additional purposes.